iffy asleep on my arm, originally uploaded by Wahj. I am typing this with one hand. The reason I am typing this with one hand (and very quietly) will be evident from the photo above. You see, any human being that remains still for any length of time in this household very quickly becomes cat furniture. 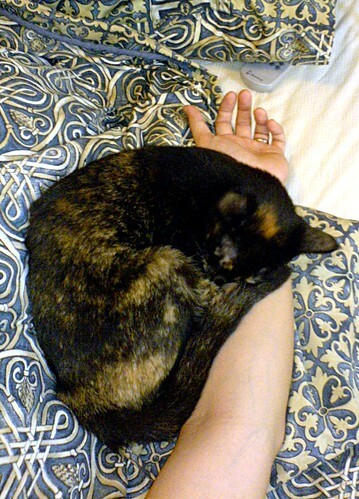 I lazed in bed too long this morning: before I knew it, Iffy had claimed my left arm as her pillow. There's no moving after that of course - not when the slightest shift in body weight earns you a pointed sleepy stare from a disgruntled cat, as if to say "Look? Do you mind? Some of us are trying to sleep here." Oh yes, and the claws come out as well. Ouch. With handphone and iBook within (one) arm's reach though, I've managed to take this photo, bluetooth it over to my iBook, edit it in GIMP, post it to flickr, and blog ... all with one hand pinned down by a cat (whoever wrote that paradox about immovable objects was obviously thinking about sleeping cats). Ink doesn't sleep ON us. He prefers not to be disturbed too (the claws come out if he is).